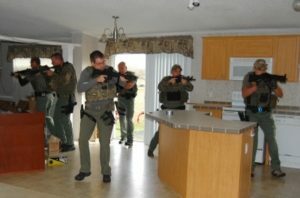 The Harrison County Sheriff’s Office’s Special Weapons and Tactics (SWAT) Team is a designated group of law enforcement professionals who are selected, trained and equipped to work as a coordinated team to resolve critical incidents that are so hazardous, complex, or unusual that they may exceed the capabilities of first responders. The primary mission of the SWAT team is the protection of life and a peaceful resolution of high risk situations. The SWAT team consists of a sniper element, entry team and a Crisis Negotiation Team (CNT). The Crisis Negotiation Team is a four member team specifically trained in hostage negotiations, intelligence gathering, and conflict management. When deployed, their primary function is to establish communications with barricaded subjects and/or negotiate the safe release of innocent persons. SWAT team members are required to be on call 24 hours a day, 7 days a week. Team members are also required to pass rigorous physical requirements and attend schools and specialized training on a weekly basis. 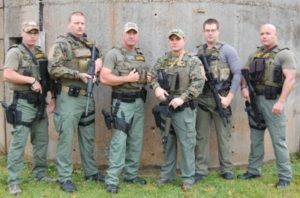 Being a SWAT or CNT member is a collateral assignment; hence the unit is comprised of members who are assigned to various full time duties in several divisions of the Harrison County Sheriff’s Office.